Will I Am and the Pockemon Crew to inaugurate new stadium! At a special press conference at Tola Vologe, Jean-Michel Aulas presented the program for the various festivities to mark the inauguration of the Grand Stade on 9 January 2016. Jean-Yves Meilland and the Pockemon Crew artistic director were present for the occasion. "The inauguration will feature everything we can do at the new Grand Stade complex. Doors will open at 14:30 for the start of the entertainment outside the ground with live music, dance and games for the children. The match against Troyes will kick-off at 17:00 CET, live in France on Canal+. Then, from 19:00 to around 20:15, the show will go live on the channel D17. I want to thank Universal for the presence of Will I Am. 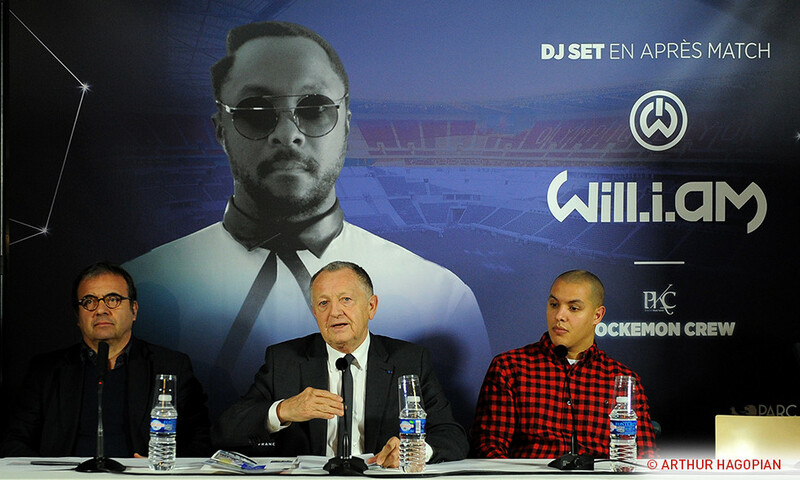 He will add a special touch, in keeping with the stature of the Grand Stade… Will I Am is a global star. It's a great source of pride to host this great American superstar… There will also be a great number of personalities from the world of football." "The show will comprise three clear moments with the key being moving from a football stadium to a concert venue. First of all there will be a human tableau of 1,500 youngsters from the OL Academy, the city of Décines and partner clubs. The Pockemon Crew will then perform. They will also be helping us in the first part of the show by working on a choreography with the children for the human tableau. Then there will be a set from Will I Am for 45 minutes for the grand final with the Pockemon Crew." "Firstly, I want to thank Jean-Michel Aulas and Jean-Yves Meilland for their confidence. It's a great opportunity for us to be a part of this amazing adventure. The company will be accompanied by 40 dancers for the Will I Am show. We will also look after the 1,500 children and prepare their choreography. They are delighted. Everyone is very excited. It's going to be a unique experience. We can't wait… OL is our club, our passion. We represent the colours of OL in the world championships."